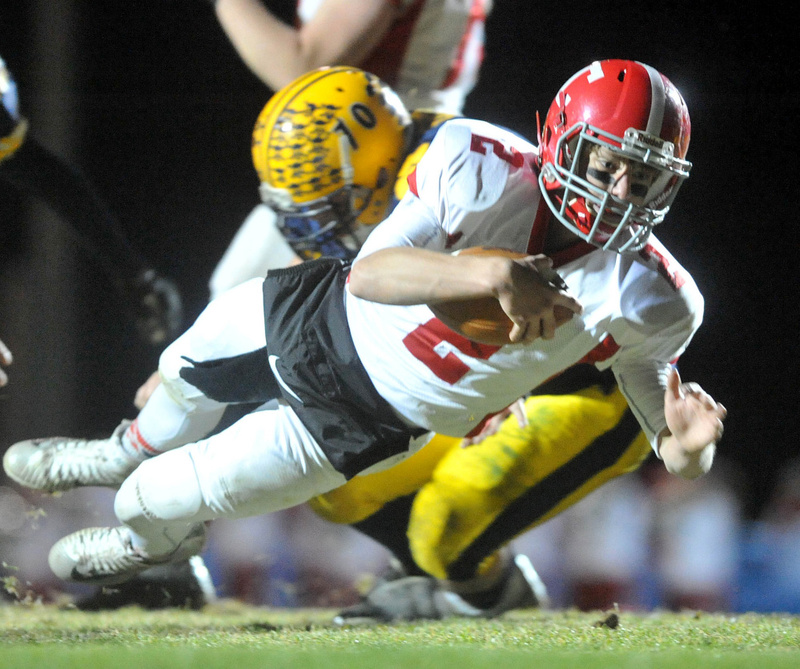 Cougars lose teammate to injury, then storm past Rams in PTC B playoffs. FARMINGTON — Facing a 20-point halftime deficit and the loss of one of their best players, the Mt. Blue High School football team pulled off an inspired, improbable comeback Friday night at Caldwell Field. 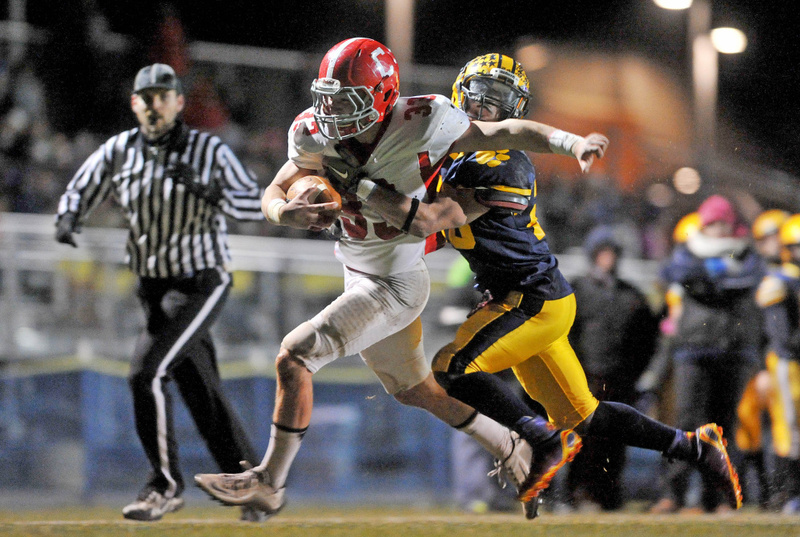 Ryan Pratt found Nate Pratt-Holt in the left edge of the end zone on fourth-and-goal at the 10-yard line with 47.9 seconds remaining to give the fourth-seeded Cougars a 35-34 win over No. 5 Cony in a Pine Tree Conference B quarterfinal. “Our kids just showed so much, it’s unbelievable,” Mt. Blue coach Jim Aylward said. “We were defeated and we fought back over the course of 19 minutes. Mt. Blue began the second half trailing 27-7 yet moving the ball effectively when Cony linebacker Max Storey delivered a crushing blow on Cougars’ senior running back Alex Gilbert with 7:48 remaining in the third quarter. Gilbert remained down afterwards flat on his back as the schools’ trainers attended to him and emergency personnel were called. Ten minutes after the hit, EMTs arrived, stabilized Gilbert on a backboard and transported him to Franklin Memorial Hospital. “Alex was responsive, Alex had movement, most of what we did was precautionary and we hope he’s OK,” Aylward said. “He took a big hit. It was a big, clean hit. Right now my thoughts turn to him. 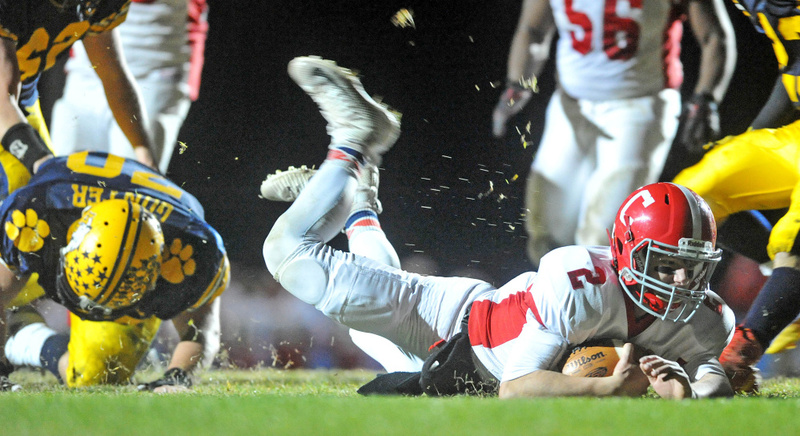 After a 24-minute delay, the game resumed and two plays later Cony fumbled the ball away at their own 26-yard line. Two plays after that Zach Meader ran it in from 4 yards out to cut Cony’s lead to 27-13. 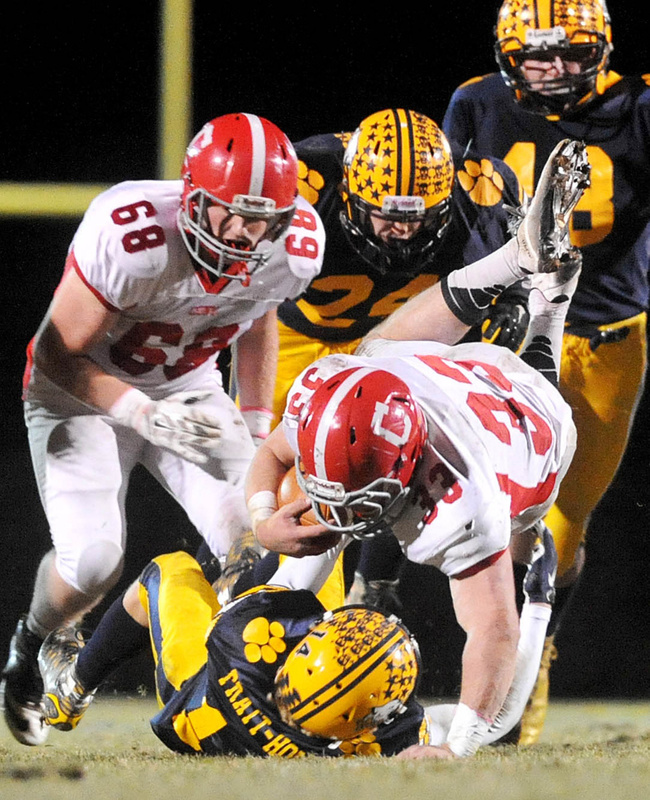 The two teams traded touchdowns on their next possessions, but with just under eight minutes to play in the fourth quarter, Cony seemed poised to put the game away as it lined up for a 24-yard field goal. Nate Pratt-Holt came in unblocked off the left edge, though, and blocked the kick, which Christian Whitney returned to the Mt. Blue 42-yard line. The Cougars hit a hook-and-ladder play for 23 yards on first down where Pratt threw the ball downfield to Pratt-Holt, who immediately pitched it to Christian Whitney. On the ensuing play Whitney pitched the ball to Pratt-Holt in the backfield for a 35-yard touchdown on a wide-receiver reverse to make it 34-29 with 7:02 to go after the two-point conversion was successful. Cony’s next possession stalled and the Cougars got the ball back at their own 31-yard line with 4:26 to play. Mt. 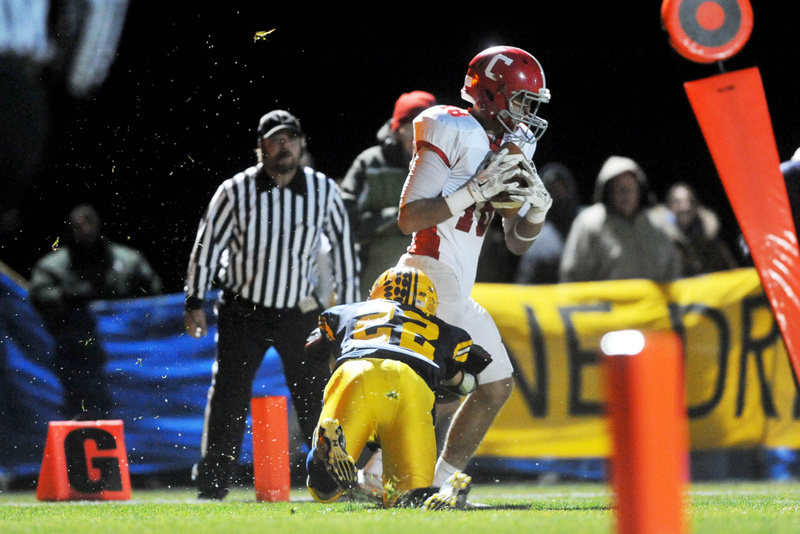 Blue systematically moved the ball downfield to set up a third-and-goal at the Cony 1-yard line. On the play, Pratt turned to hand the ball off to Meader on a fullback dive, but the ball squirted loose. 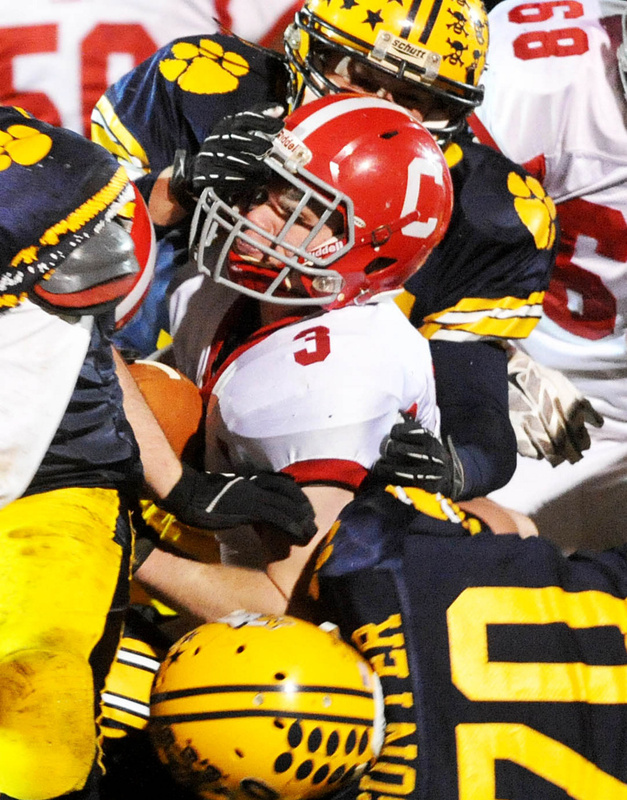 The Cougars maintained possession thanks to Whitney, though, who beat Cony’s Dylan Tudeen to the fumble at the 10-yard line. Mt. Blue came through on the very next play as Pratt bought some time in the pocket, allowing Pratt-Holt to break free along the left as the senior wide receiver caught the ball falling out of bounds with 47.9 seconds remaining to cap off the comeback. “We were going to run a fade and either Ryan was going to throw it up in the back of the end zone or he was going to signal — wave his arm — which meant he wanted me to stop when he threw the ball, so more of a back-shoulder throw,” Pratt-Holt said. Cony could not mount a last-second response and two plays later Whitney intercepted Taylor Heath to seal the win. “We certainly had them on the ropes,” Cony coach B.L. Lippert said. “The blocked field goal is what I thought changed momentum. We had a chance to go up 16, instead they’re in good field position. Friday night’s game could not have been scripted any better at the start for the Rams. Cony possessed the ball for the first six minutes and scored on a 9-yard touchdown pass from Heath to Anthony Brunelle, capping off a 13-play, 79-yard drive. Brunelle then recovered a short kick and hauled in a 33-yard catch to set up Reid Shostak for a 5-yard touchdown plunge to give the Rams a 14-0 lead before Mt. Blue even touched the football. Shostak finished the game with 34 carries for 141 yards and two touchdowns, as well as two catches for 34 yards and a receiving touchdown. He also completed a 46-yard pass to Chad Bickford. Brunelle had seven catches for 115 yards and Joel Bennett had five catches for 106 yards. Whitney paced Mt. Blue with 20 carries for 107 yards, while Pratt-Holt hauled in five passes for 59 yards — all in the second half — and also added 37 yards rushing.